Track Highlights: Back in the era when there were elementary afterschool programs, Kevin’s playground leader noticed that he was faster than most of the other kids. He suggested that Kevin run in a local track meet. Kevin entered and the rest is history. 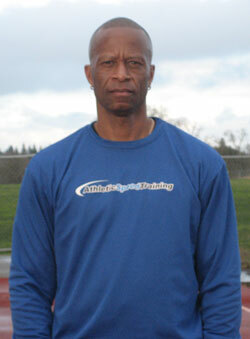 He competed in two California high school state championships, placing 6th in the triple jump in 1974. He went on to compete for University California at San Diego (NAIA) and qualified for two nationals (400m, 200m), and became school record-holder for both events, and was voted UCSD’s first “Athlete of the Year” in 1978. His career as a masters athlete has been a wonderful journey. He has been solidly ranked nationally and internationally since 1996. He has several world championship medals to his credit. He was voted USATF “Athlete of the Year” (track events) in 1996, 1997 and 2001. He also ran on the American record-setting 400-meter relay (40-49) at Mt. Sac Relays in 2004, and is currently listed on the World Record (40-49) 1,600 meter relay set at the Penn Relays in 2001. Kevin was also the World Record Holder for 200 meters (45-49) in 2002. Houston Elite is thrilled to have Kevin as a teammate!